From left: Marquis Lopez, Keenan Wallacea and David Flowers have been arrested in the case. 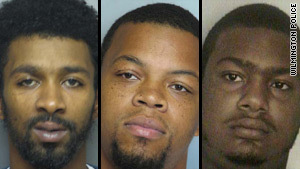 New York (CNN) -- Three Delaware men face charges after police found about a pound of heroin and a pistol in the car driven by one of them, authorities said Friday. The arrests, which occurred Thursday morning, capped a 6-month investigation by the Wilmington police and the Drug Enforcement Administration, according to a news release from the Wilmington Police Department. Just before 2 a.m. Thursday, detectives were following a 2005 Dodge Durango carrying the men from Philadelphia International Airport to Wilmington when the driver, Marquis Lopez, 27, realized he was being followed and sped off, the news release said. Delaware State Police stopped the car after a chase, took the three men into custody and called a drug-sniffing dog. After the dog alerted to drugs, a subsequent search of the truck revealed a hidden compartment containing a loaded Glock .40 caliber handgun and 19,500 bags of heroin -- each containing 0.025 grams of the drug, police said. "This was a major bust to the supply of heroin to Wilmington," Sgt. Steven Barnes told CNN. "Lopez is one of the larger suppliers to Wilmington street dealers. The hidden compartment was done very professionally, [but the] dogs still hit on it without a problem." The heroin -- estimated to weigh a total of 487.5 grams, or nearly 1.1 pounds -- had an estimated street value of $195,000, police said. No bail was set for Lopez, who was turned over to the DEA for federal charges; his passengers -- Keenan Wallace, 27, and David Flowers, 27 -- were charged with trafficking heroin and possession with intent to deliver heroin and conspiracy. They were taken to Howard Young Prison in lieu of $550,000 and $266,000 bail respectively.